Dr. Yang was professional, thoughtful and thorough. He takes his time to get to know his patients and to think throughthe problems they bring him. This means longer wait times but I think it is worth it. Dr. Yang was professional, thoughtful and thorough. He takes his time to get to know his patients and to think through the problems they bring him. This means longer wait timesbut I think it is worth it. The visit was good and Dr. Yang and his team provided an excellent service. I am happy to have them formy primary care. I highly recommend them. The visit was good and Dr. Yang and his team provided an excellent service. I am happy to have them for my primary care. I highly recommend them. 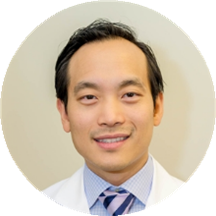 James Yang is a reliable and caring internist and primary care doctor serving the community of Washington, DC. Dr. Yang obtained his medical degree from Emory University, he also completed his master’s in public health and residency in internal medicine at the same institution. He completed his residency in internal medicine at The George Washington University Hospital and a fellowship in geriatrics at George Washington University. Dr. Yang is a part of Metro IPC/Capital Hill. Dr. Yang is board certified by the American Board of Internal Medicine. In addition to serving his patients, Dr. Yang is an active clinical educator of medical students as well as Master's and Doctoral students in the George Washington University School of Nursing. Dr. Yang treats a range of conditions, and he is eager to help the wider community receive the care they deserve. Patients trust his expertise because he consistently provides high quality care that leads to positive and lasting health outcomes. Dr Yang was both incredibly professional and relatable, easy to talk to and knowledgeable. Great care from an amazingly talented and professional physician. He spent time asking questions and gave excellent advice with evidence supporting the advice. I am a physician who just moved to the area and needed a primary physician. He skipped over a few minor things but nothing other physicians Ihave had would not do as there is only so much time during a visit. I would recommend him. He was very candid with me regarding my concerns and put me at ease. Great PCP. Remembered things I forgot in regards to family history. Really thorough and empathetic. This was my best physical assessment ever. Dr. Yang took his time and explained everything to me in detail. There was also an intern with him and he was also explaining to the intern which I liked a lot. I believehe may have also solved a problem which I have been battling for a while. Dr. Yang was great. I did have a little bit of wait ,but Dr.Yang apologized for this. The wait was worth it because Dr.Yang spent more time talking with me than any other doctor ever has. He is funny and understanding. Great Doc, highly recommended. I like him. I’m going to stick with him. Very knowledgeable and provide a great plan of resolution for my underlying issue. He was great the wait time was ridiculous! Dr. Yang was absolutely amazing. He genuinely felt concern about the condition I spoke about. It was a pleasant surprise to speak with someone who gave examples showed care and have several useful recommendation. I’ll definitely visit again. Dr. Yang is great - professional but friendly, really takes the time to explain the issues and treatments in a way that makes sense. Dr. Yang is very professional and good natured. He is friendly and he took the time to listen and explain everything about treatment and plans. The staff is very professional and fast. I highly recommend them. Very professional. Efficient and pleasant interaction after a slightly lengthy wait in the waiting room. Dr. Yang is really great. He actually sat and talked with me about what was going on and why I didn't feel good. He wants to get to the root cause of problems. I have depression, anxiety and thyroid issues. Iwas quick to assume that my recent problems were because of my thyroid and wanted to just change my dose of thyroid medicine, but he wants me to try an antidepressant and also low-dose naltrexone to treat autoimmunity, along with a small dose of a muscle relaxant to help with my TMJ and joint pain. I was reluctant to take more pills at first, but I feel that addressing the root problem and not just blaming my thyroid immediately is a better route to take. I have been blaming my thyroid for almost 4 years since my surgery - hopefully Dr. Yang's treatment will help me. He is always a doctor that you can talk too. Hie is genuinely concern about your condition. He is fantastic and treats his patients with respect. Best doctor I’ve ever had. This time was much better than the last, I felt he listened to me more and because of that he was ready and willing to help me get healthier. Dr. Yang by far is the best primary care physician I ever had in a very long time. One of the best in DC! I like him but his office is terrible. Long wait times and a lot of rigamarole to get prescriptions and refills. I am very happy with Dr. Yang and his staff. They are professional and listen to your concerns and that is why I followed them to the new location on Rhode Island Avenue. Dr Yang has been my Primary Care Doctor for some time now and he is always professional and courteous. I trust his opinion and his honesty. I will always keep him as my Doctor for as long as I can. I thank him very much. Dr. Yang is a rarity in this age of medicine. He is a throw-back to the times when Dr's would spend time in examining/questioning patients, showing sincere interest in their well being and conditions. He is not only interested in treatingyour condition, but also focused on getting to the root of the cause and how to eliminate. I have been going to Dr Yang for 6+ years and so happy to have discovered this special Dr who genuinely cares for patients and people. Having Dr. Yang as my doctor is wonderful. He takes his time and listens. He is truly concerned about my health. We are partners in getting my health in order. He is the best. Office wait time was far less than last time I went to office; also, as usual ; he spends a good amount of Time with me and is familiar with my info when he comes in. Thoughtful and careful approach to medicine. I value the informative way he discusses my health with me. Great doctor! Unfortunately I did wait about an hour and a half to be seen though. I received detailed attention as a patient, including a thorough examination. Excellent practitioners. My visit with Dr: Yang was wonderful. He did not rush me but took time to answer my questions. He made me feel comfortable. l would recommend him highly to others. I found Dr. Yang to be very, very professional. Dr. Yang was able to explain my condition to me and helped me make a better choice for my health. He was able to talk with me and calm me down somy Blood Pressure was able to drop a great deal. Love my inter actions with him. Other than the wait time, Dr. Yang was able to address my concerns. I waited over an hour though. Awful provider. Apathetic towards looking into symptoms and provided no meaningful insight. I had to wait unusually long to see Dr. Yang this time; not normally so long. But Dr. Yang takes all the time that you need with him or that he needs with you, asking questions to ascertain your problem. Heseems to keep current on research and bases his treatments on it. What I appreciated about Dr. Yang was his patience, openness to listening to my insights , willingness to educate and explain the whys, hows and what’s, and frankness about what doctors don’t know. Dr. Yang was excellent in diagnosing my condition and explaining it to me. Very personable bedside manner. Dr Yang is very attentive,professional and helpful.